We have emerged as one of the well-established manufacturers, suppliers and exporters of a wide range of Cylinder Liners, including Moly Hard Cylinder Liners and C.I. Base Rough Cylinder Liners. 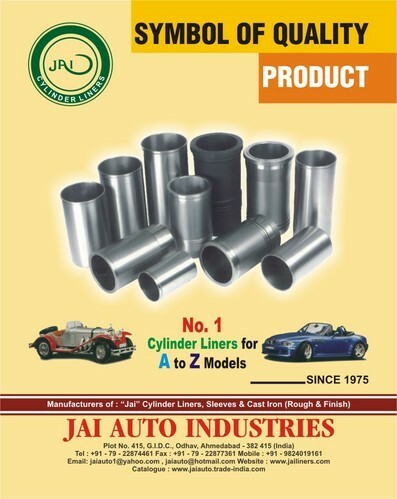 The Cylinder Liners are used in Motor Cycle & Scooter, Tractor, Industrial & Agri. Engines, Cars Commercial Vehicles & Diesel Engines, Air Compressor & Compressor, and C.I. Bars for Valve Seat Insgrs. These are marketed under the brand name 'JAI'. Apart from this, we are dealing in Automobile Spare parts and Equipment. Our entire range is manufactured using high grade raw material, so that the end products conform to set industry norms. Available in various lengths, sizes and other technical specifications our range can also be customized as per the customers’ requirements.